My wife Pat and I had been looking forward to a road trip north that had been on the calendar for months – an excursion to Bend, Oregon, to visit longtime friends Al and Cathie Poncia. This is how far back the acquaintance goes: Pat’s parents and hers – all four now deceased – had been buddies since the 1930s. That’s how Pat first came to know Cathie, through the parents. I entered the picture much later, in the mid-1980s, after Pat and I married. Pat and I saddled up on a Saturday morning in mid-October, eager to spend time with the Poncias, whose principal residence is a cattle ranch in Marin County, north of San Francisco. Although they make it in one very long day, we elected not to overdo it, spending the night in Mount Shasta, a pleasant-enough burgh tucked snug against the majestic, 14,000-foot-tall mountain after which it is named. By noon of the day following we had arrived at the Poncias’ house, a handsome two-story built a few years back in a highly desirable neighborhood of custom homes. The first day I went out with Al, who had plotted out a loop for us to traverse north and east of Bend. He had traversed it before by himself … and on his beloved Harley. Luckily for me, he opted for the Toyota minivan this time. It proved ideal, plenty roomy and, no doubt, offering a smoother – and quieter — ride than the Harley. While Al and I were off hunting for photographic quarry, Pat and Cathie knocked around town. There is plenty to keep one occupied in Bend, a lovely city which in recent years has attracted so many people – a veritable swarm of California transplants – that it ranks among the nation’s fastest-growing cities. Since 1995 the population has trebled – trebled! – to more than 80,000. One visit is enough to explain why people flock there. Property, however, is no longer cheap. Housing is a lot less than in the Bay Area – almost anywhere else is – but it’s now beyond the budget of many. Good if you are a native of Bend or thereabouts, not good if you’re considering relocating. Our first stop was Madras, about 40 miles north up Hwy. 97. Al wanted to visit a favorite agricultural supply store, where he chatted with a salesclerk about some implement he had been contemplating purchasing. He was tempted – mainly because there is no sales tax in Oregon versus as much as 9.25 percent in California – but managed to keep his wallet in his hip pocket. While there Al asked if any of the store hands knew of any old barns in the area that might merit a “Kodak moment” (in my case a “Nikon moment”). After several heads were scratched simultaneously, one said, “It’s not a barn, but there’s an old, abandoned house at the top of the hill just outside of town that lots of people take pictures of. Look for the fake eagle; can’t miss it.” He pointed us in the direction, and we were off. We reached the summit and no eagle manifested, faux or real. Didn’t matter, though, for I spotted an old house in a field that looked like our target. We turned around and slithered off onto the side road where it sat, abandoned and looking forlorn. I hopped out and, resting my arms on a barbed-wire fence that separated me from the subject, I squeezed off several shots from different vantage points. Looking at the LCD screen on the camera, I was satisfied. (One of the views is shown here.) “Let’s go, Jeeves,” I said to my driver/navigator/spotter. 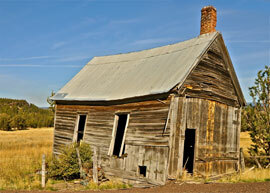 From there we headed southeast, stopping next in Prineville, an old railroad town of 7,356. It was founded in 1877 and named after a prominent local merchant, Barney Prine. According to Wikipedia, Prineville enjoys “reasonable weather and views.” Exactly what constitutes a “reasonable view,” I have no idea. The terrain was flat as a pancake. The best view we could find was that of a Starbucks, just off the main drag. Once we had quaffed our respective foo-foo drinks – Al is a latte man, I’m keen on cappuccinos (less flavor-compromising milk) – we meandered south on Hwy. 56, a county road that led us into the hinterlands. 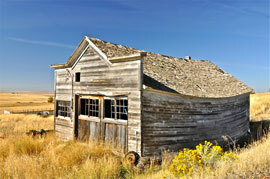 It wasn’t long before we encountered a come-hither old barn, sitting tight along the two-lane road. “Stop!” I said. “You want that?” “Yes!” So Al backed up and remained in the car while I used the roof to brace the camera. Continuing farther east on Hwy. 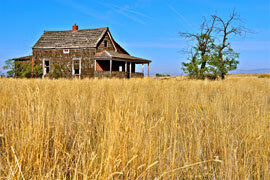 56, within a half hour or so, over a crest, we espied an old, vacant stone farmhouse. Al guessed it was from the late 1800s; I guessed earlier. As was the case with the Madras house, a barbed wire fence screamed, “No Trespassing.” Usually I regard this as an overt invitation to enter, and enter I did, although I narrowly avoided impaling myself. That would have been a picture unto itself. I got a number of good shots, the lowering sun casting warm, amber rays on my subject. I scrambled back over the fence – several cows mooing behind me, as if to say “good riddance, intruder” — and into my chauffeured chariot. Not far down the road was Paulina, a hamlet that makes Prineville look like a metropolis by comparison. (Per Wikipedia: population 123, households 58, median age 43.4 years. Basically, a modern-day version of the proverbial one-horse town. The locus of what little human activity we could find the General Store, where a few souls gathered outside, chatting spiritedly about seemingly nothing. As soon as I entered, I spotted a vintage – and still functioning! 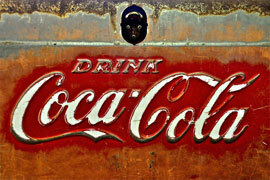 – Coca-Cola ice chest, easily from the Fifties. The exterior paint was magnificently weathered and worn. Here is the shot I took. Genuine keeper. Al’s car lacks nav, and I didn’t have my GPS-equipped smartphone with me (dumb, I realized). We promptly got lost, and I do mean lost, despite having been given explicit directions from a rancher at the General Store. Soon we were on a narrow, gravel back road, not sure where we were or where we were headed. Finally, Al got a phone call from Cathie. “Where the heck are you guys?” Answer: “Ah, not sure, but the setting sun is to our right, so we must be headed south.” An hour or so later we were back at their house, and by now it was pitch black. Taking pity on us Lost Boys, Pat and Cathie had mercifully gone out and fetched take-out for all of us. By the time Al and I got to it, it wasn’t exactly burn-your-tongue hot, but it didn’t matter. Food never tasted so good to these two bedraggled sojourners! After dinner, Al sat down with a map and, using a highlighter, traced a loop for my solo adventure the day following. 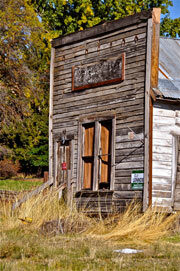 In surveying the map, he remarked, “I think you ought to go to Shaniko, the ghost town. Heck, you could spend the entire day there.” So, Shaniko got heavy highlight treatment. From Shaniko, I would drive east, then south, then west and south, to Bend. Al made sure I would not be shunted off onto any gravel roads. I made sure my GPS-equipped smartphone went with me, just in case. When I left the house at 6:30 a.m., it was dark and gloves-needed cold, both thermometer mercury and shivering. As I slid into a freezing driver’s seat, I wished we had brought our new car with the bun-warmer feature (it works wonderfully!). Fair skies and sun were forecast, however. En route out of town, I stopped at a local caffe that was just opening as I drove up. A bracing two-shot cappuccino under my belt, I headed off, hoping that the day would prove as productive as did the day prior. For the first leg of my expedition, I followed yesterday’s trail. 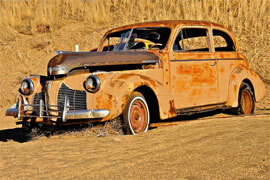 About half an hour north of Bend, I spotted my first photographic prey, an old, abandoned, rusted, banged-up 1940s Chevrolet coupe sitting dejected (and rejected) in a salvage yard. Fingers crossed that no one would see me – I cross my fingers a lot when in the field – I ambled over to the car, fairly drooling as I approached. 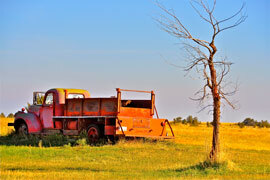 The colors were terrific – all rich, earthen hues – car and background alike. Looking over my shoulder to ensure that no attack dog was around, I took a sequence of shots, from different angles, elevations and focal lengths. Here is one of them. I have photographed literally hundreds of specimens of “abandoned art” – automobiles, trucks, tractors and the like – and this, to my surprise, ranks among my all-time favorites. I say “surprise” because it wasn’t until I got home and saw the image on my 27-inch computer monitor that I realized how extraordinary it is – not the shot, but the eye-pleasing palette of colors. From here it was on to Shaniko, an hour or so up Hwy. 97. There was no mistaking the name of the town. A huge billboard shouted, “Welcome to Shaniko the Ghost Town.” Having visited two other ghost towns, both in California, I was excited by what I might find. Sure enough, a lot of cobwebbed, ramshackle buildings, all of them empty save for one, a come-hither General Store, which functioned as sort of a modern-day, rural 7-11. So Al was mistaken, not literally a ghost town. The woman behind the counter looked pretty real, as did the bottle of Crystal Springs water I purchased. Seemed the least I could do to help stimulate the local economy. As I sauntered about town, camera about my neck and fairly champing at a call for service, off in the distance was an old fire truck, sitting on a patch of green grass and near a “ghostly” leafless tree. “Wow,” I thought to myself, “if I happen not to capture another noteworthy photograph on the entire trip, this alone might be worth the 1,500-mile roundtrip trek to Bend and environs. All told, I spent perhaps an hour and a half there, squeezing off shots of this, that, and the other thing, including other abandoned vehicles and a row of storefronts, including several windows with glorious reflections in them. Here is one of them. 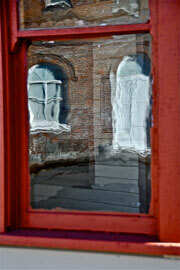 The undulations evident are produced by the uneven surface of the 150-year-old pane. Although not quite correct about its being literally a ghost town – signs of human life, as noted – he was correct about its being a veritable trove of photogenic subjects. Crystal Springs bottle perched securely in the car’s drink holder, I pushed off deeper into the high-desert hinterlands, uncertain what I might encounter. Not knowing what I might find sits well with me, well, for the most part. I don’t like getting lost, which I have done, but I must say I do like subjecting myself to the vagaries of fortune. Indeed, I find the “adventure” aspect as alluring to me as the photography per se. A short distance south lay the burgh of Antelope, half the size of yawn-inducing Paulina – population 59, 27 households, 18 families, per-capita income $17,444 (ouch!) and, not surprisingly, 22 percent below the poverty line. Whilst lollygagging in Antelope, I shot a deserted 1950s Dodge truck sitting behind another single-wide and an old building – façade shown here – that looked as though eons ago it may have been a retail establishment. I loped on eastward on Hwy. 218, gazing at the natural beauty of the surroundings and offering mute thanks to the glorious weather – sunny and in the 70s, unseasonably warm for mid-October in the Oregon outback. In less than an hour I found myself at the intersection of Hwy. 19, which runs north-south. There, in all its dubious glory, sits a town – I kid you not – named Fossil – population 469, 208 households, 128 families, per-capita income $16,236, only 12 percent below the poverty line, half of what it is in Antelope. Among Fossil’s claims to fame is a restaurant – term used loosely here – and a filling station aptly named “Fossil Fuel.” I had lunch, such as it was, at the eatery. Wish I hadn’t. Grub OK but I waited a seeming eternity for the food to be delivered to my table. After telling the waitress “I’m here for lunch, not dinner,” she apologized, saying, “Sorry, the cook overlooked your order.” My tip reflected the level of service. Heading back to the 218/19 intersection, I noticed in the distance a cool-looking old barn, which I stopped to take pictures of. While squeezing off a few shots, a car approached and the driver rolled down the window. He said, “You’re not local, are you?” “No,” I replied, “Just passing through. I’m from California.” “We’re pretty much local, I reckon. We’re from Spray.” Spray? Did I hear correctly? As in Ocean Spray? “If you are interested in barns, the Spray denizen continued, “you have to drive north on 19 to Mayville. You’ll see, on the left-hand side of the road, a barn with a sunken roof. I think you’ll find it worth a picture or two.” “Thank you,” I said, and off I went in search of a picture-worthy barn with a sunken roof. When I spotted it, maybe 20 minutes away, I could tell in an instant he was right: definitely “worth a picture or two.” I parked on the shoulder and, risking my life, stood in the middle of the road to capture a few images that I really like. Here is one of them. Am I right or am I right? Although I didn’t know it at the time, the Mayville barn was the last subject I was to shoot that day. The sun had begun to lower, and during the entire stretch back to Bend – two hours west and south of the Fossil/Mayville metropolitan complex – I failed to find anything else that struck my fancy. In fact, as I drove west through the verdant Ochoco National Forest, my eye wasn’t so much on photo-op possibilities as it was on the gasoline gauge. With the “empty” light on and my fingers crossed, I limped into Prineville, yes, THAT Prineville, which only a day earlier Al and I had passed through … after stopping, you will remember, at Starbucks. Never did a fuel pump look so good, even better, I confess, than the take-out repast that had greeted Al and me. In retrospect, it was a “Mission Accomplished” trip. The weather was mostly spectacular, as was much of the scenery, the fellowship with the Poncias fun and rewarding as ever, the photographs captured on Ye Olde Memory Card splendiferous. For these reasons and more, it was “glad I made the trip.” Time, petrol and megapixels well spent.